Historic Fanny Bridge located in beautiful Tahoe City and received its name from all of the fannies that can be seen from the road as gawkers stare over the edge into the cool waters. 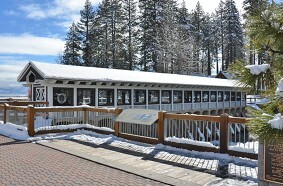 Located over the only outlet of Lake Tahoe (into the Truckee River), Fanny Bridge is a historical spot. Be sure to count the fannies as you drive over the bridge.